There are many parts of Africa that are perfectly safe for international travelers. Southern and Eastern Africa are great places to start—these areas are popular with tourists because it is relatively easy to get around and there are great campgrounds. This basic advice can help you make sure you have a safe camping trip in Africa. Photocopy important documents: Be sure to keep copies of your passport, visas, driver’s license and other important documents and keep them in a safe place. If your passport is close to expire you can renew us passport here. Leave valuables at home: Leave expensive jewelry at home. The last thing you need is to give someone a reason to steal from you. If you have any other valuables that you can live without for your trip, leave those at home too. Also, keep in mind that if you are going on an extending camping trip, you will likely wear out most of your clothes due to the rough environment. It’s a good idea to pack clothes that you are okay replacing when you get home. Be discreet: If you are coming to Africa, chances are you will want to carry camera equipment to get once in a lifetime photos of your travels. We lived and traveled in Africa for four years without any problems, but it’s important to be discreet. Put your camera away when you are not using it—remember that much of Africa has huge issues with poverty; you don’t want to flash your fancy electronics unnecessarily. In your car, keep valuables hidden. Lock your doors: Keep your doors locked if you are traveling by car. It’s okay to keep the windows down, but in crowded areas be sure to roll them up. On safari, be sure to keep your windows rolled up unless you are looking out that window—this is to make sure you don’t have an unwanted visitor in the car when you aren’t looking! Water Safety: It’s a good idea to be careful about where your water comes from while traveling in Africa. Many foreigner-owned campsites throughout the continent will have filtered water that is safe to drink. In other places, it’s a good idea to use a filter, or buy bottled. Be sure that the bottles are sealed—people are notorious for filling used bottles and reselling them. Vaccinations & Medications: Vaccination requirements vary from country to country, and change frequently. Consult the Center for Disease Control website and talk to your local doctor about what they advise for vaccinations. Some countries require proof of vaccines—they will no allow you entry to the country if you do not have proof of the vaccination. If you are on prescription medications, be sure to carry your prescription and make sure to have an adequate supply of your medications for the duration of your trip. Malaria Precautions: Malaria is a real issue throughout many parts of Africa. Anti-malaria prophylactics are recommended in many areas. Discuss the options with your doctor—there are a variety of medications available with various side effects. While camping, make sure your tent has working mosquito nets—use them all the time. Even while on anti-malarial medications, it’s important to use bug spray. Animal Safety: One of the reasons you are planning an African camping adventure is to see animals. But, they can also pose a significant safety risk. Be sure to keep food and trash secure. Be aware of your surroundings and ask locals if there is anything you need to be worried about. 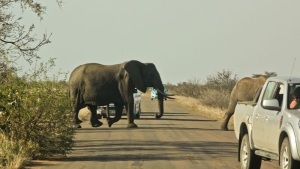 Lions and other predators will not likely be a concern, but elephants, hippos and snakes can be a problem for campers. If you are camping throughout Africa, you will need to be concerned about safety. But, if you use a bit of caution and common sense, you should have a wonderful, and safe, experience!